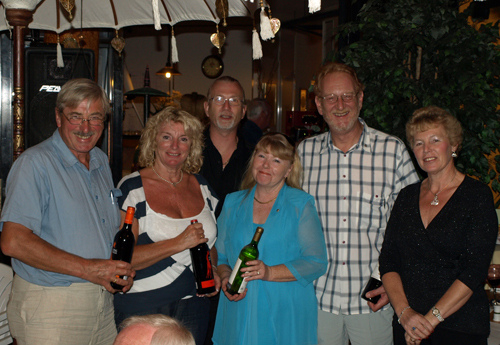 The Lions Club International, Santiago del Teide branch, held their annual quiz at Bar Amozonia on the San Francisco urbanisation, just outside Los Gigantes, on Saturday evening. 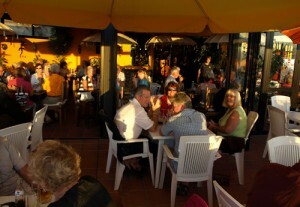 The bar, with its tropical feel, together with the sun going down was a perfect venue. 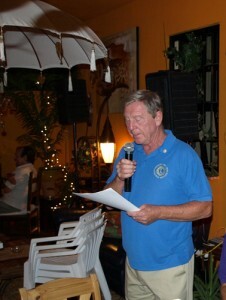 The quiz master, Lion Ken Ward (right), put all the teams to the test. A total of eleven teams of 4 contestants entered the battle for the Losgigantes.com sponsored event. The evening and questions were punctuated by food, so after three rounds the food was duly served, if you like ribs with BBQ sauce you would have loved this spread, the next half hour being spent munching then the following half hour with the tooth picks. The final round was about to be delivered. The points were being tallied by Lion Steve Gilbert and his assistant Jamie Gilbert who had spent most of the night collecting and delivering question and answer papers to and from the assembled protagonists. The battle continued and in the end only 1 point separated the winners from the runners up. The Sponsors wish to thank all who took part for making the night a success and Ken Ward for his work preparing the quiz as well as Steve Gilbert for his adjudication and Jamie Gilbert for his help. 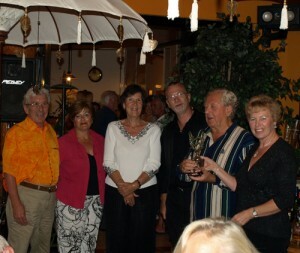 A total of €230 was raised for Lions causes.